Today, 19th April we received in the mail an envelope from a past guest who stayed with us back in March.Â They were Joel & Barbara from Fort Collins, USA. While they were staying with us Joel did a sketch of our garden and house from the bottom of the garden.Â He said once he had finished it he would send us a copy and this is what we receivd today. After a pretty busy season Robert and I decided to take a few days off and go away. Our ten year old grandsons were visiting Christchurch from Auckland so we decided to drive down there and pick them up and take them to Akaroa on Banks Peninsula with us. We spent four lovely days there. The weather was amazing, the boys had one swim andÂ decided that it was a bit cold and I, after much deliberating, decided to go swimming with the Hector Dolphins. This was amazing although there weren’t a lot of them. We took the city boys to aÂ working farm where they rounded up sheep in stock pens and through gates separating them. It was so much fun. We are now back home and ready to tackle any new guests who come along, not literally though, the break has certainly revived us and we are waiting to greet you all. This season I decided to put in a veggie garden.Â This is quite unusual for me as we haven’t had a veggie garden for probably twenty years.Â Anyway,Â I’ve done it and have planted corn, spring onions, green and butter beans, carrots, beetroot, courgettes, peas , lettuce and radish.Â I am so proud of my little garden as Â everything is growing well much to my husbands amazement.Â I’ll let you know when I harvest the first crop, whicheve it may be. Well what a day.Â Actually, it all started on Christmas Eve, when I went along toÂ Church for the Mid-night service.Â This actually started at 10.30 and as several of my guests wished to attend a Christmas service they came with me, which was really nice.Â We didn’t get home until just after 12.30am and it was an early rise for myself, 7am,Â Â as we had a special treat for Christmas breakfast. After breakfast, a planned trip to my elderly parents, where I prepared a Chistmas lunch and shared it with them, my husband Robert, Â one of my sisters and her partner and adult son.Â Â Â Â About three it was time to head back to our home and await the arrival ofÂ more guests.Â I decided that I would take a brief nap and woke 2-1/2 hours later.Â Felt really guilty, but hey its Christmas – right! Â This weekend has been very busy, but enjoyable for us at Olde Mill House.Â On Saturday we hosted an end of year ChristmasÂ BBQ for myÂ workmates.Â It started with a cycle around a couple of the local vineyard cellar doors and ended up with a BBQ at Olde Mill House.Â We invite our house guests to join us.Â As the evening progressed we had a bit of a soiree where everyone had to perform an item.Â Â Â We were treated to singing, poems, dancing and a skit or two,Â a great time was had by all. On Â SundayÂ night we had another BBQ to catch up with friendsÂ Â who will be away over Christmas.Â We had a great time reminiscing and looking forward to what the New year will bring. Well finally it looks like summer has arrived. Lovely warm weather, a little windy but still fantastic for cycling the vineyards and having a great time. Hope to see you soon. Well what a surprise, today we got a phone call asking if we would mind if a gentleman came to have a look at our garden with a view to photographing it for a magazine. Keep a watch out and if we get chosen we will inform you of which magazine and which issue. We are very excited. In September we went away for our annual holidays and while we were away we were advised by our dog sitter that Vinnie our 11 year old border collie passed away (suddenly 09/09/09).Â For those of you who have visited Old Mill House and played with VinnieÂ you will remember him as the veryÂ energetic dog that would have youÂ endlessly throwingÂ a stick, ball or log of wood for him to chase and retrieve.Â Â Â No-one could believe that he was 11years old. I hold fond memories of all you folk who would go out back and play stick with him, thank you all so much. 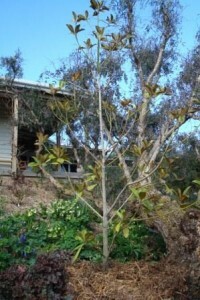 As you can see in the photo our Pepper tree is dieing , so we have just planted next to it a Magnola GrandifloraÂ . It is evergreen and has large perfumed white flowers. They originate in the swamplands of southern USA. 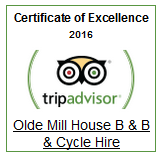 But we hope it will like it’s new home at the Olde Mill House B&B & cycle hire in Renwick Marlborough New Zealand. 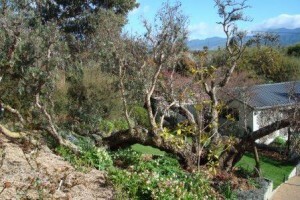 Hunters Garden Marlborough is on in November from the 4th to the 8th. 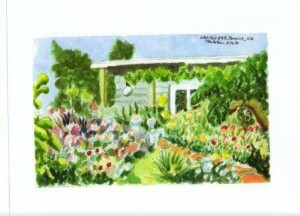 Bookings opened Â forÂ all of the events on August the 3rd for this years garden marlborough. 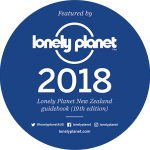 WeÂ Â currentlyÂ have three roomsÂ available, so it would be advisable to get in early if you don’t want to miss outÂ – Â book now ! !